Samsung Galaxy Tab 3 10.1, both Wi-Fi-Only (GT-P5200) and 3G (GT-P5210) variants, appear on GLBenchmark’s servers. The Galaxy Tab 3 10.1 is yet to be announced by Samsung itself, but the the device has been circulating around the rumour mill for quite some time now. According to the benchmark, the Galaxy Tab 3 10.1 packs a Dual-Core Intel Atom Z2560 processor clocked at 1.6GHz with Hyper-Threading, a PowerVR SGX 544 MP2 graphics processor with a clock speed of 400MHz, a 10.1-inch WXGA (1280×800) display and will come with Android 4.2.2 Jelly Bean out of the box. 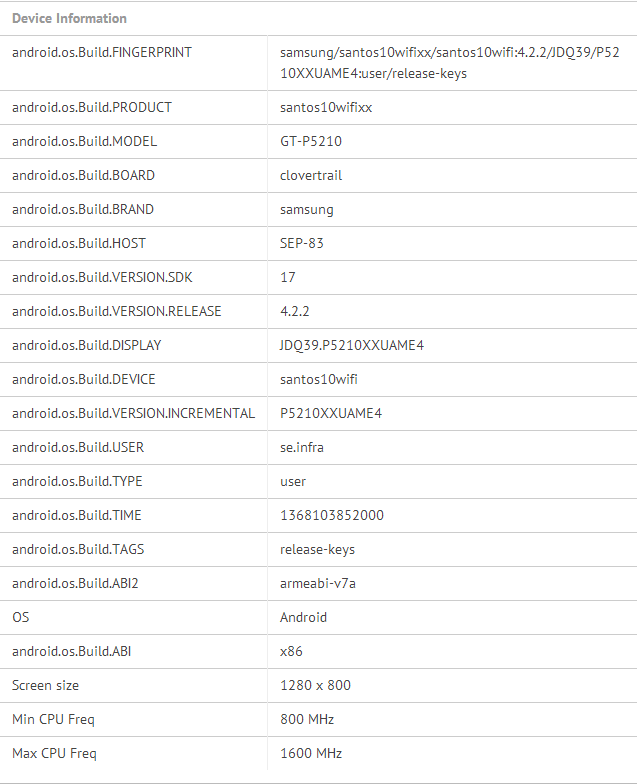 The Galaxy Tab 3 10.1 made an appearance in a leaked Antutu benchmark, earlier this month. The device scored a whopping 24616 points, which brings this into Qualcomm Snapdragon 600 and Samsung Exynos 5 Octa territory. This is the highest score we have seen on any tablet device, the Nexus 10 with Samsung’s Exynos 5 Dual (5250) processor scored around 13K points on Antutu. It certainly seems that the Galaxy Tab 3 10.1 will be one hell of a performance beast and the only downside being the low resolution WXVGA (1280×800) display. We hope these benchmarks were performed on an early prototype and the final product might have a high-res display. We compared Galaxy Tab 3 10.1’s 3D Graphics performance with the Galaxy Tab 2 10.1 and the Galaxy Note 10.1. An Atom inside? Maybe Samsumg are planning to make a Windows 8.1 pro version of this as well? An Intel CPU seems like an odd choice considering their isn’t as many compatible apps on the play stare as there is for ARM based devices. It’s not high-end, the high-end model is yet to arrive. nice :), waiting for this one it will be my 3rd one.